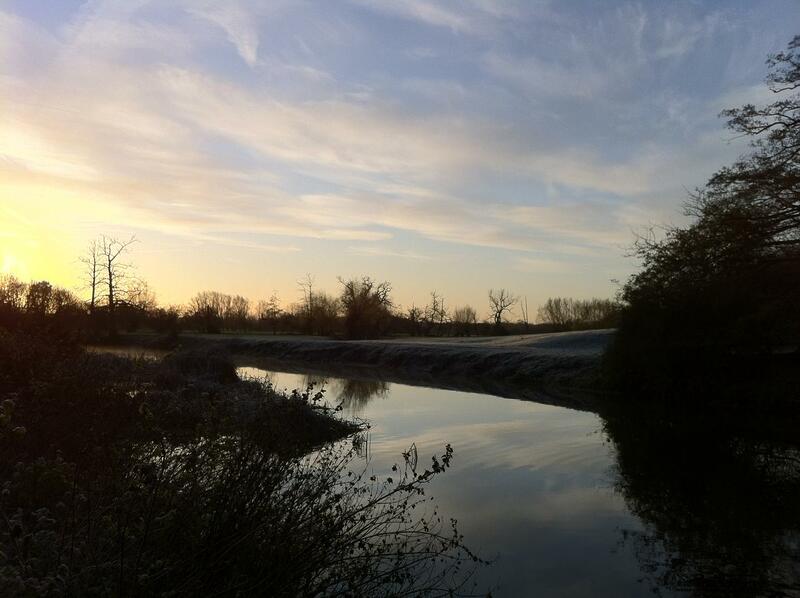 This was the scene that greeted me Saturday morning at 8.00am, the first hard frost of the winter and lovely blue sky. The plan was simple, walk up and down the bank lure fishing for Pike and then an hour fishing vindaloo flavoured meat for Chub. 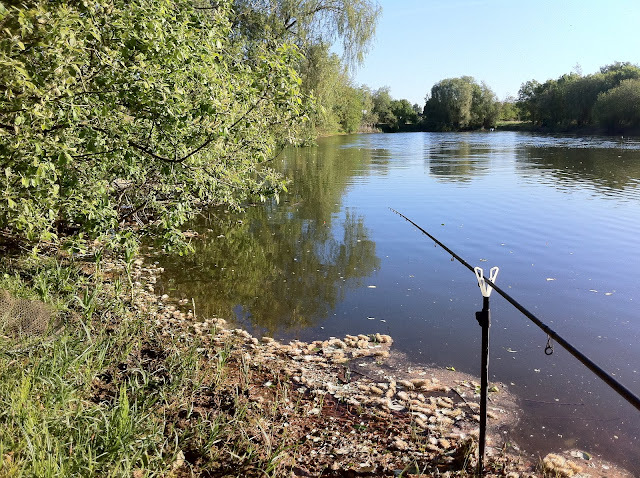 Sadly a couple of fishless hours, and after trying every lure in my armoury I changed tactics. 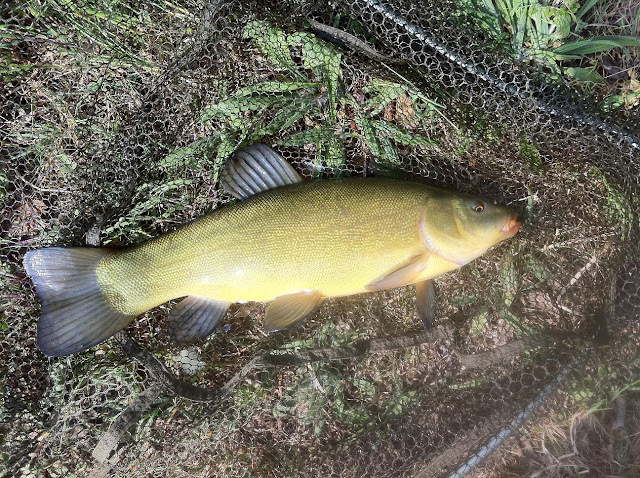 River was a touch coloured which is always a good sign and I didn't have to wait long for the first fish, with the hook buried in the bait, the rig did it's job and soon after the rod tip rattled the fish was on the bank, a nice Chub of 4lb 8oz. Sadly no more takers, but I went home happy. 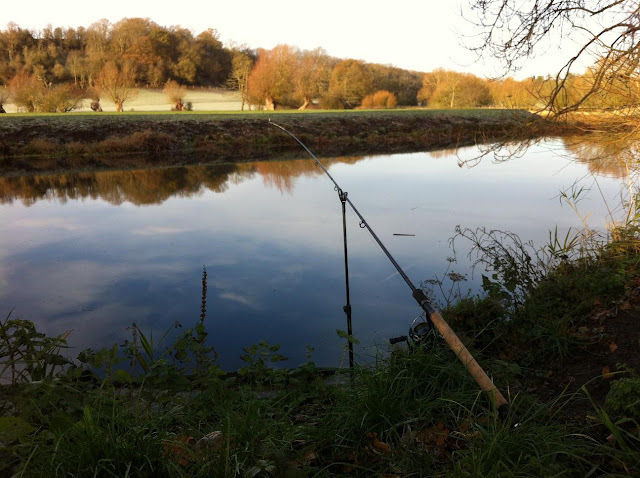 Fished just upstream of the S Bend, river was gin clear again. 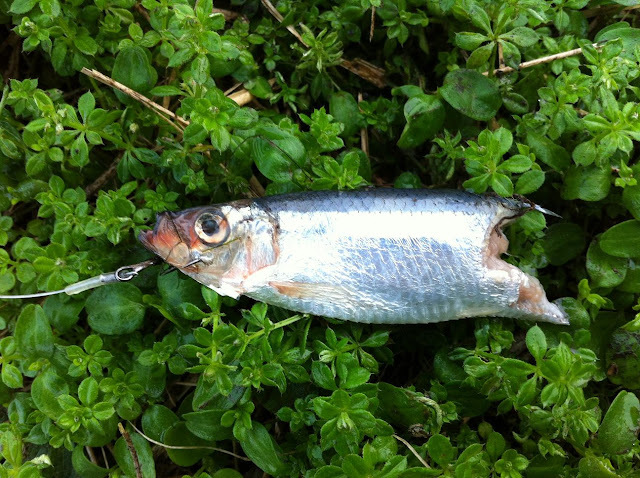 One rod with luncheon meat and other sprat fished in the margin. Within a few minutes of putting the sprat in I had a small jack on the bank, greedy little begger. I was trying out some of the new Grey's bait anchors to hold the luncheon meat on, seemed to work pretty well to retain the meat on the business end but the cheeky Chub were on a smash and grab mission as I was having some of the most violent indications on the rod tip but not long enough to strike. 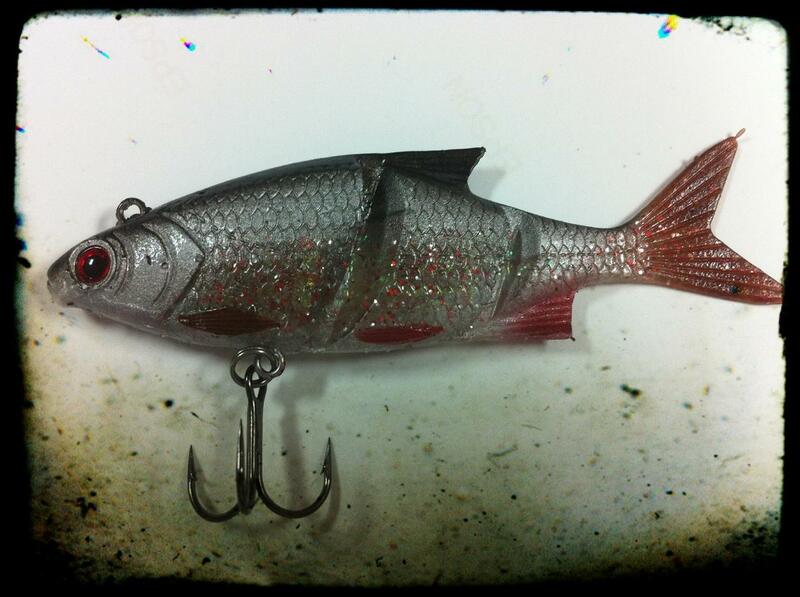 I was using a running rig so maybe next time I'll go semi-fixed with the hook buried in the hook instead. A couple of other anglers just downstream from me were fishing stick and maggot and when I left, hadn't even had a bite. Can we have some more rain please, the river needs it. 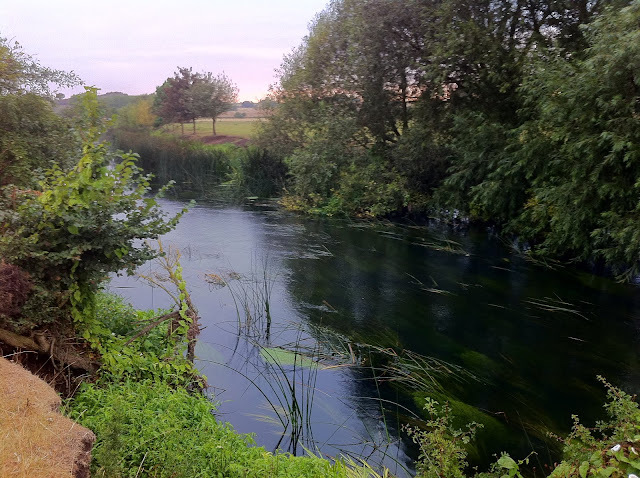 I knew I should have taken my Chub gear :( the Avon was coloured for the first time in ages and Wasperton has always been good to me when fishing for Chub. Simple tactics work, curry flavoured luncheon meat on a running rig. 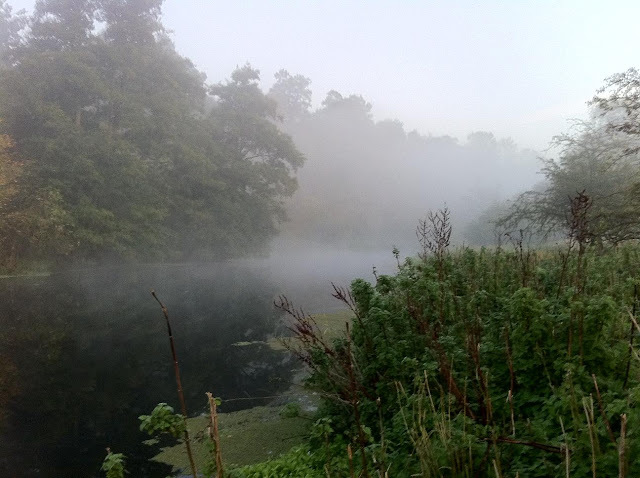 What a glorious morning, I arrived at 7.00pm and intended to lure fish for Pike, started upstream of the S bend and walked up and down towards Hampton Lucy Weir, tried every lure in my box, even rattling and bright coloured lures which would help in the coloured water failed big style. 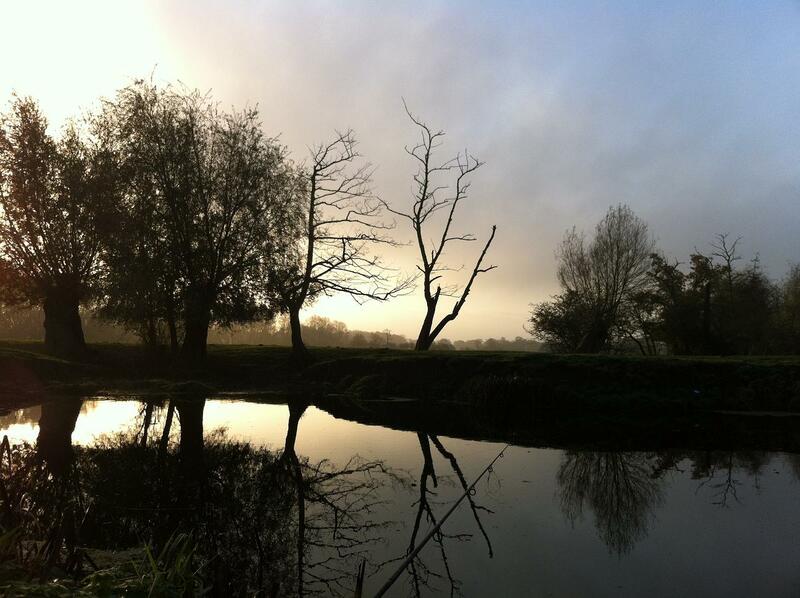 I left at ten and as I've said before fishing can be secondary, with scenery like this on my door step catching something is often a bonus. I'm a freelance automotive CAD designer by trade, and currently I'm working on some future model MG's at the Longbridge factory in Birmingham. 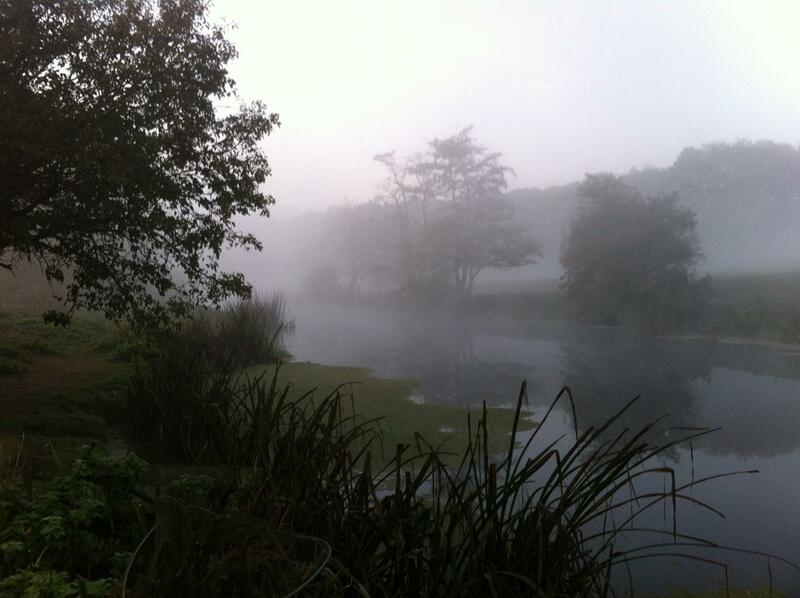 So the match was 4 hours at the Willow Marsh Fishery in Shenstone, near Kidderminster. 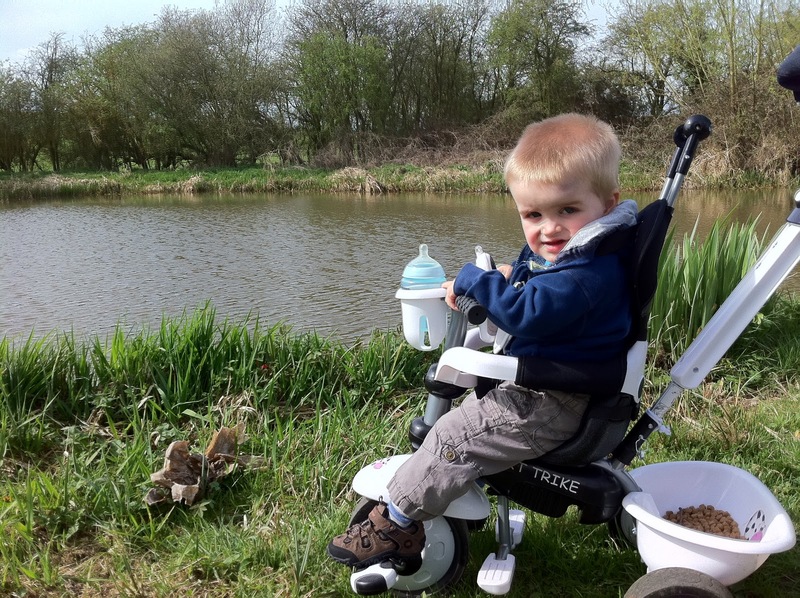 we were fishing the Sandpipers Coarse Fishing where apparently the match fishing record was 184lb 10oz. 24 fished it, 12 MG vs 12 SAIC anglers. The winner from MG had around 40lb the next best around 20lb. I was bored catching tiny roach and when the MG angler caught a decent carp quite early on I had no choice but to try and catch a carp. 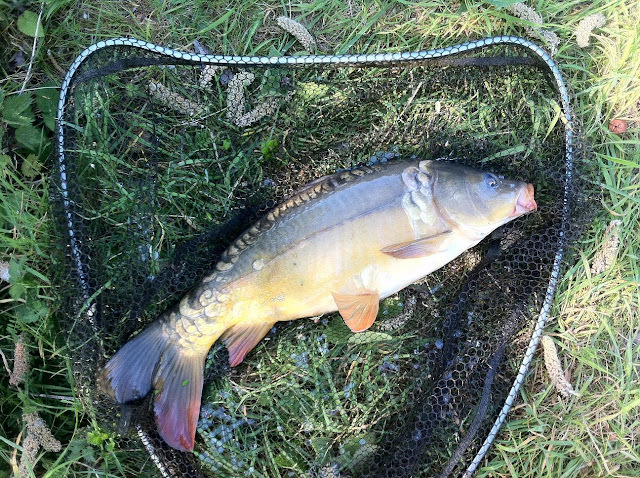 Sadly the bigger carp were not biting and I tried everything, I ended up last out of my 6 man section with 2.5lb, all tiny roach and a small mirror carp. The pools were very, very low so I suppose that's not going to help the fishing, even a couple of people blanked it was that poor. It was a team match and SAIC were victors in the end, that's the main thing. 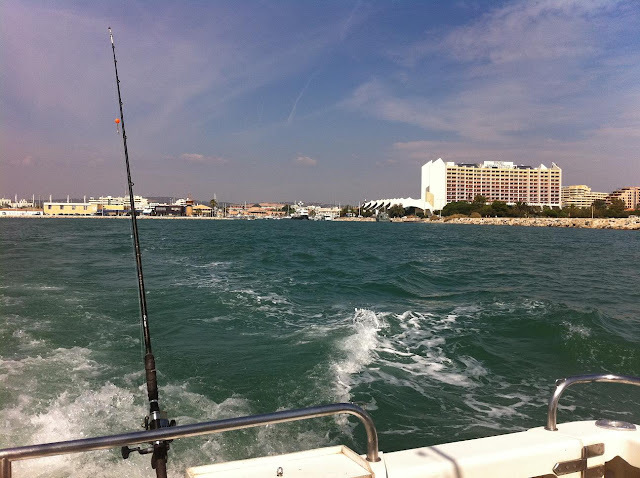 I'm off on holiday to Portugal this week so I'm going to try and do a bit of sea fishing with the father in law. I have a BAA book, never fished Barton before so went for a few hours. I got there early to try and fish the weir swim but there were a few anglers already there. 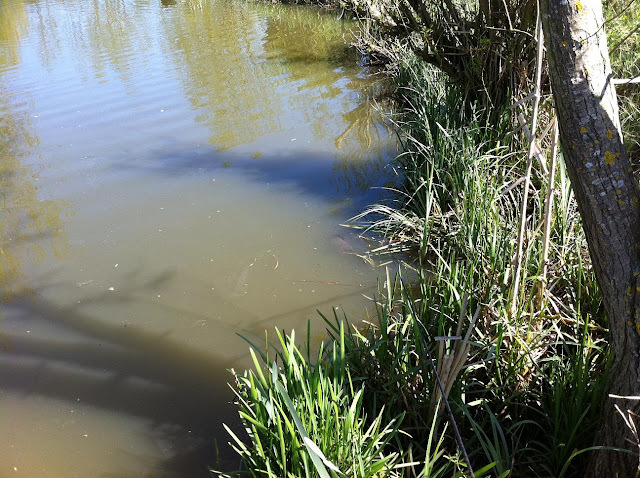 Two had been there overnight, 3 rods, bite alarms, carp rods and short hooklength carp rigs, not had anything apparently apart from chub knocks. 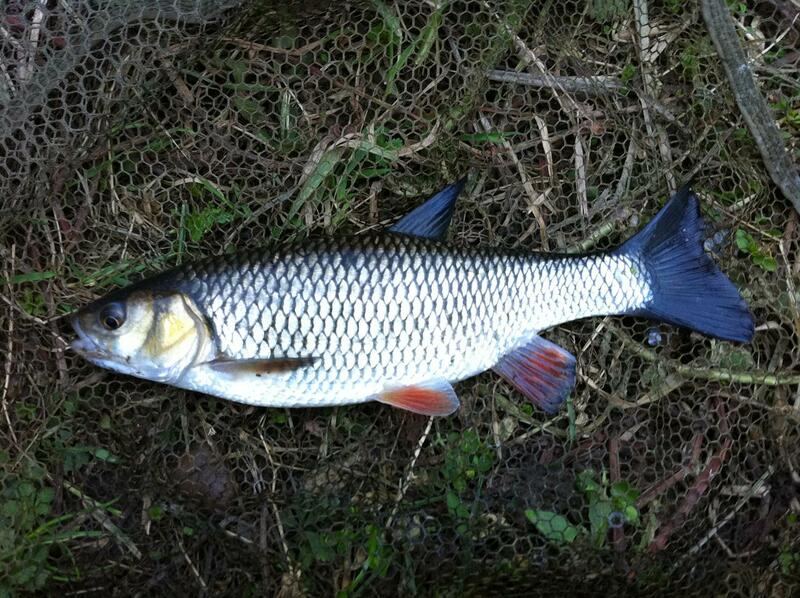 they pointed out a dead barbel just in the margin, looked a decent size too :(. Another angler on the next peg down had a small chub. I settled in a swim just downstream of the weir, a swim that was littered with rubbish, cans everwhere, luncheon meat tins etc, great. Gin clear and I could see decent chub in the swim, couldn't connect to anything decent though, biggest about 3/4's of a pound. The three anglers eventually left and I had the last hour in the weir peg but no takers. What really pi**ed me off though was the angler who was on his own clearly just left his rubbish, this was an angler who used a trolley to cart all his stuff to his peg. Why ?. I'm not going to renew my BAA book next year, I don't want to be associated with the angling underclass who give us decent anglers, those that appreciate the countryside a bad name. Everytime I've fished a BAA water I've had problems in one form or another, BAA need to act in my opinion, have more baliff's, ban people. Couple of Crucians and a Roach well over a pound, also hooked a couple of carp that I couldn't to anything with. Might specifically target the crucians the next time I go, a sensitive float set-up, fished a couple of foot from the edge, slightly over depth and maybe a single grain of sweetcorn or even a soft hook pellet. No brainer really, 5 mins from my house and after another blank at Wasperton earlier in the week, and being frustrated by streamer weed I decided that I wanted to catch some fish. 6.30am till about 10.00am more or less a bite every chuck. Waggler, maggot and about a rod length out manged a nice variety of fish. 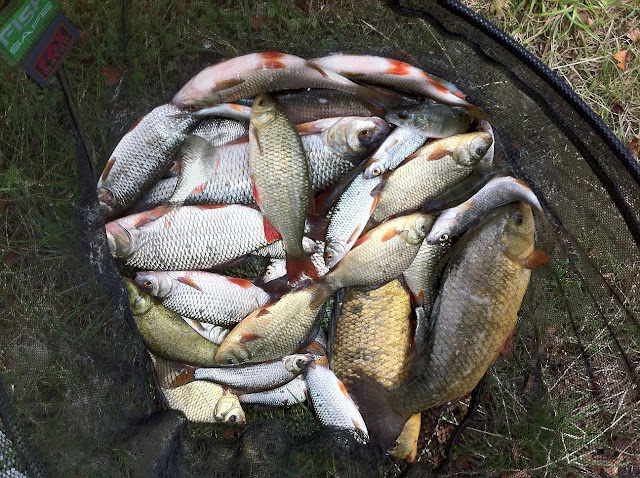 Perch, Roach, Crucian Carp and Skimmer Bream. Biggest roach was well over a pound, a lovely fish. Must have missed 50% of the bites too. 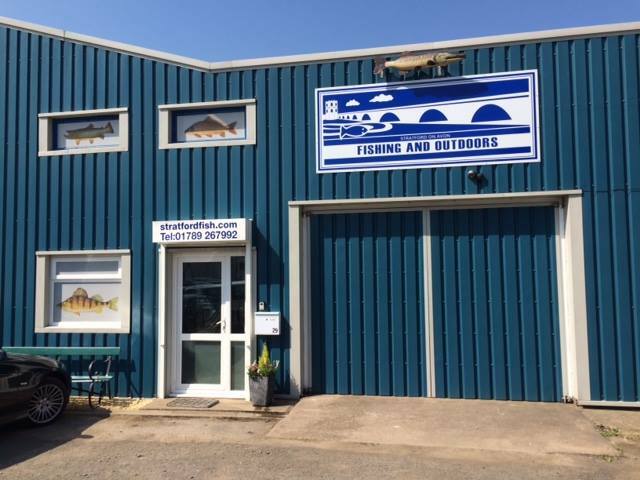 Lovely setting too, I must spend more time here, some quality fish and such a huge variety. For those of you with the Leamington Anglers Association Book, you will know this swim very well. 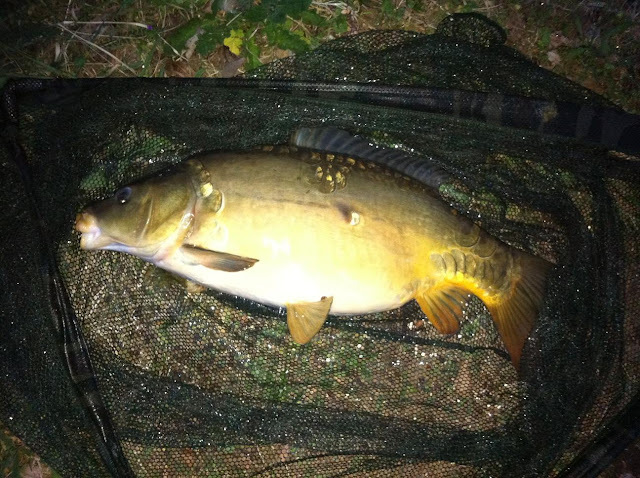 fished it from 8.00pm till 10.00pm and blanked, feeder with pellet and halibut groundbait mix and a big halibut pellet on the hook. 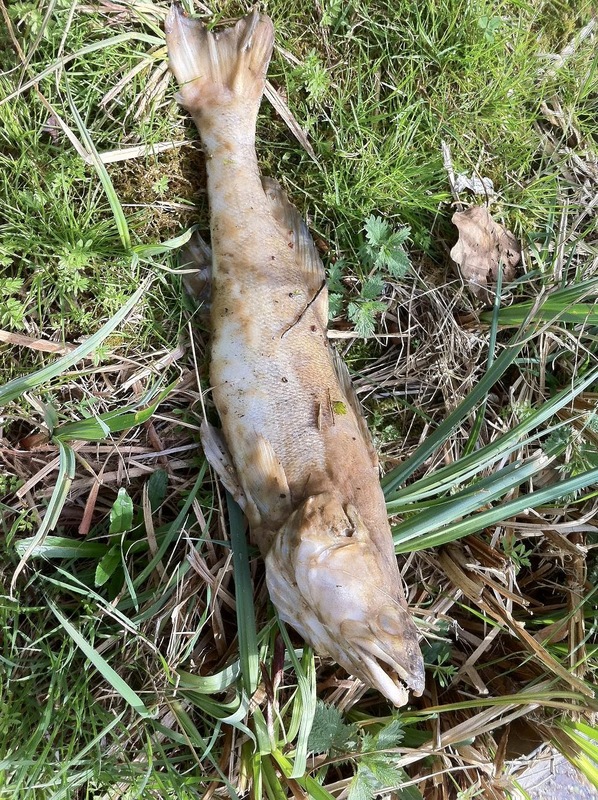 Had quite a few sharp chub pulls but sadly no 4ft twitches, I've caught Barbel from here before but River painfully low at the moment and was plagued with weed coming downstream wrapping round the line. Might give Snitterfield Reservoir a go next and wait for some decent rain. I said I would go to another river again after I blanked but Wasperton is the closest river stretch to me ( 10 mins ) and I set out far later than I wanted and only had a couple hours of fishing. Anyway fished downstream of the propeller peg, fished one rod with halibut pellet and had a nice bream just under 8lb last knockings. Felt a bit sorry for it really, didn't put up much of a fight, like he'd given up. Went to Wasperton for a couple of hours, should of looked and listened, no fish showing when I started fishing and it stayed like that when I left, even after some rain earlier on didn't make a fat lot of difference, a royal blank. Another river next time then. 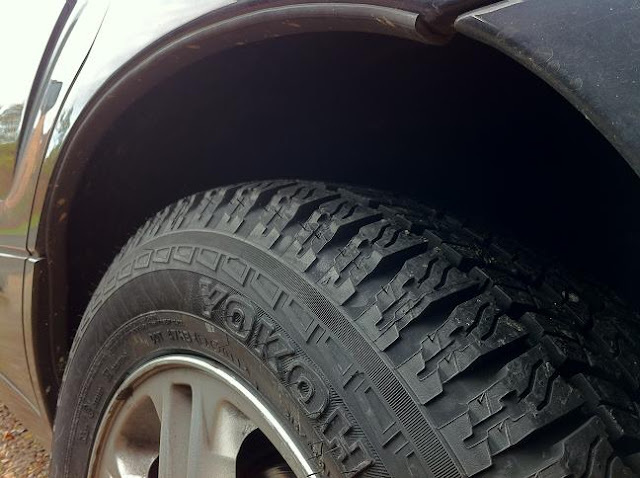 However that was it :( had quite a few knocks in low light but sadly no four foot wrap arounds. A big carp or Barbel launched itself out of the water just in-front of me but didn't get tempted with my bait. Oh well at least I didn't blank, we need lots of rain to give it a flush through and the weed seems to be as thick as ever. 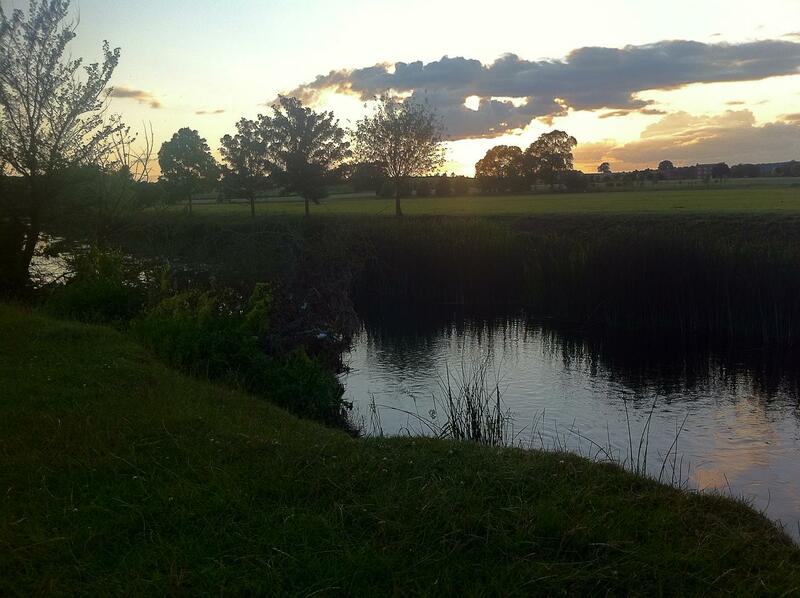 Fantastic evening though, lovely. 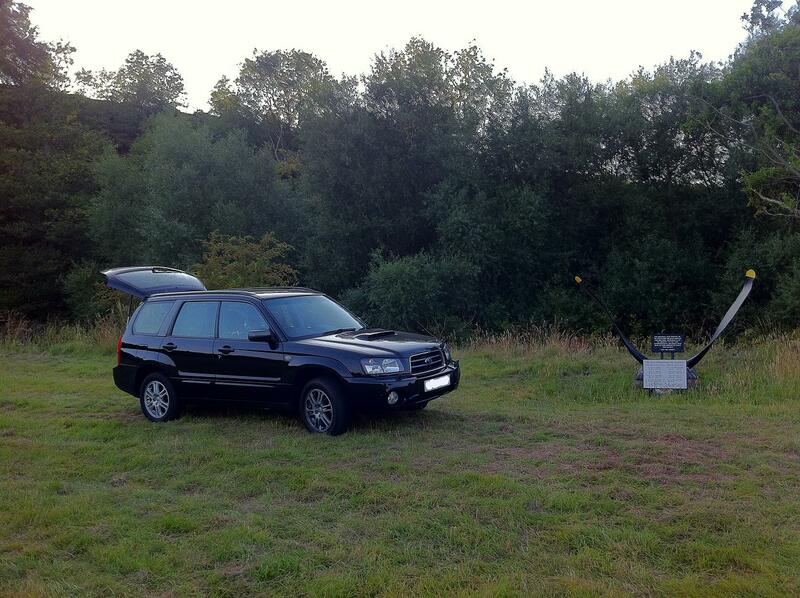 Got a new car to replace the Jag, a Subaru Forester 2.5XT. Bit of a come down really, 400hp / 400lb/ft in the Jag vs 230hp / 230lb/ft in the Subaru, good thing though is I can now venture to swims that I wouldn’t normally fish and I can now fit the pram in the boot :). 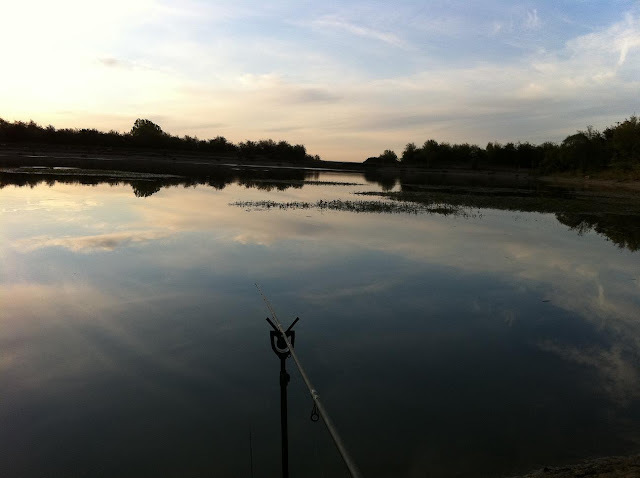 Only fished a couple of hours tonight, the propeller peg at BAA’s Wasperton stretch. Never fished it before but full over cover for Chub and Barbel looked ideal, very clear and slow though, better get the excuses in early. A few pegs down were two other anglers fishing, sharing the same car obviously as they proceeded to talk loudly / shout at each other from across their swims. Luckily they left at around 9.30pm, not before they were playing football with the dog they brought along and when passing they beeped their horn, It’s not like I didn’t notice they were there, I despair. Strange I only ever seem to have incidents when I fish a BAA water. Anyway back to the fishing, fished a margin rod with luncheon meat and also a feeder rod with halibut pellet on the hook and halibut groundbait and various sizes of pellet in the mix. Had a run on the margin rod but sods law was taking a pee and didn’t get to the rod in time. Fished an hour into dark and decided to switch to meat on the feeder rod, was getting those Chub hard and sharp plucks on the tip but not giving me time to react, when I eventually reeled the rig in the bait was gone. It’s was Morisson’s cheap luncheon meat which seemed really soft, that isn’t going to help now is it. 3 time I've blanked at Wasperton not good, lots of swims down here that look good so might take a more roving approach next time. ....as baby Sam was born the 9th of May, his mother Sarah was struggling the few weeks before the birth and was on crutches. 8lb 5oz, doing well, his 22mth old brother Ben not sure what to make of him though. :) Hopefully I'll get to the bank this weekend. 1College Pool again !!!!!! decided to try and connect with some of the decent Perch , tried another swim fed maggots and fished prawns / lobworms on the hook. Sadly lots of small Perch but not decent ones, biggest probably a tad under 1/2 a pound. 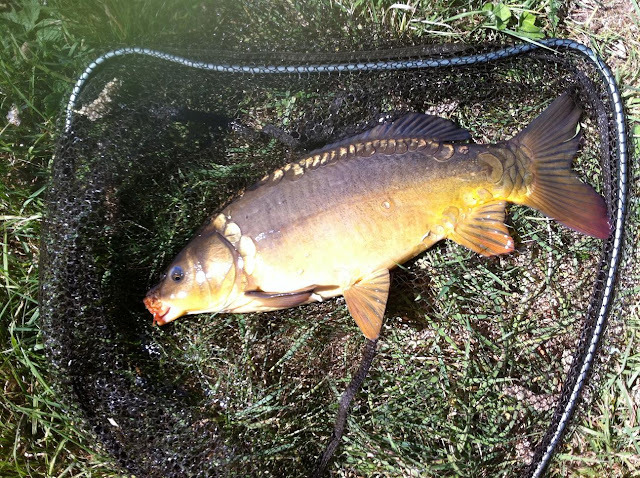 Also connected with one of the carp that I couldn't do anything about. 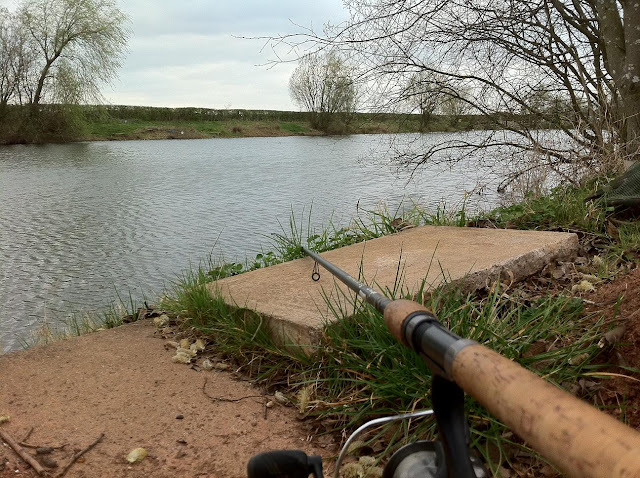 The carp were not surface feeding as usual so had a sleeper rod out with a simple running rig, a few missed takes and aborted runs I switched to a semi-fixed rig. 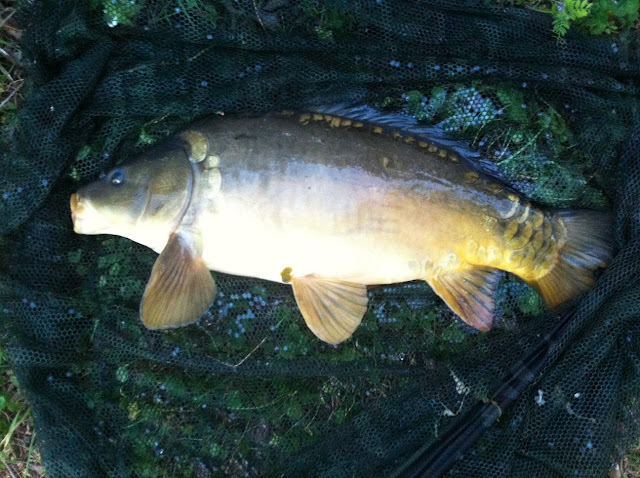 Managed 2 smallish carp on pellet, biggest about 7lb, in the 4 hours I fished. I wanted to fish in the evening as I've always had more success at College Pool but it's finding the time. I fancy a change now so might give Snitterfield a go for the crusians, anyone know if they are showing yet ? Back to the same swim for an early morning session, lovely day it was too. Noticed some Carp where feeding off the top so moved swims and surface fished some bread. The nicest way to catch Carp in my book, within 5 mins I had bagged myself a lovely mirror of about 8 / 9lb. Great fight too. I was the only one fishing at College Pool before I left at 11.30am, everyone else sensibly tucked up in bed. 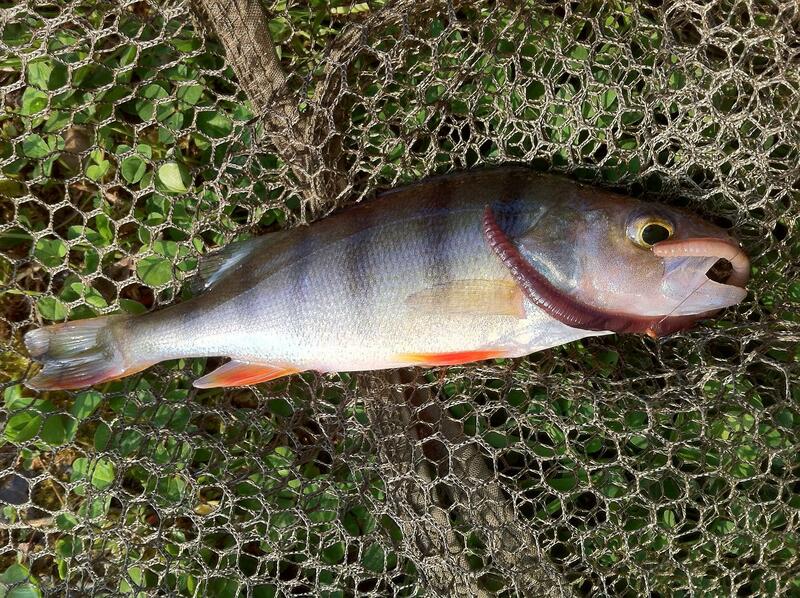 Anyway was fishing a little Drennan Bobber overdepth in the Margins, bait was lobworm and I fed chopped worm. 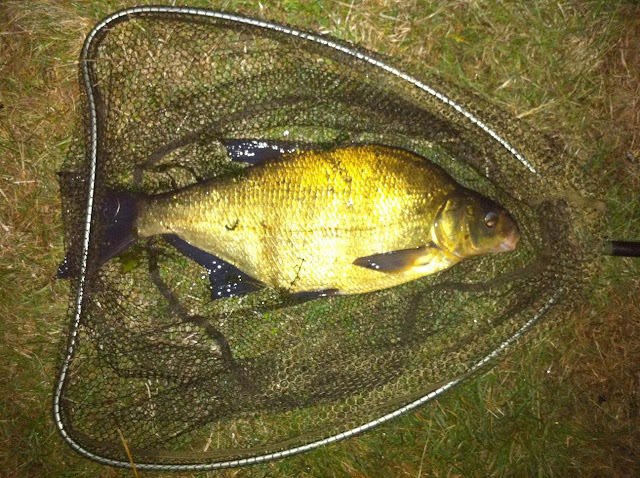 I fished from 6.00pm to 9.00pm and sadly no Perch. Did manage two nice carp though and both in superb condition, mint. 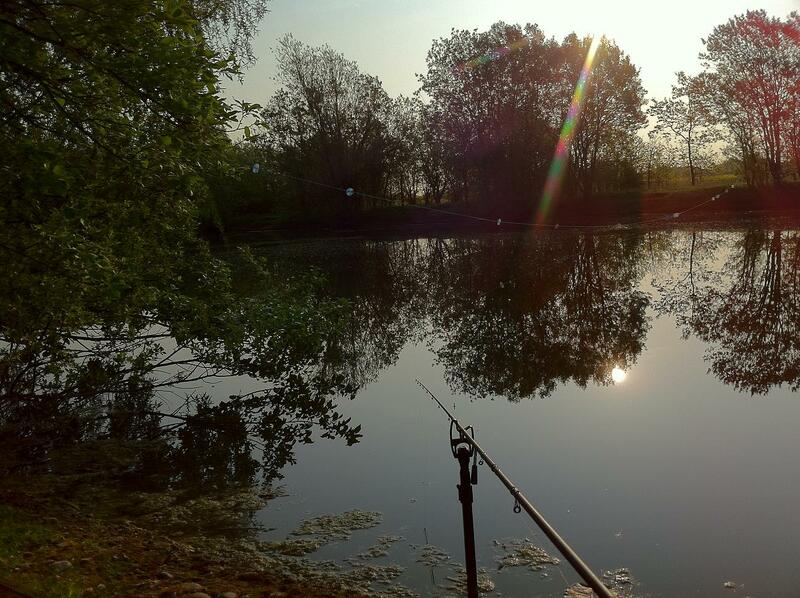 Brilliant fight on light tackle with the rod bent double. I also lost a bigger one that literally I couldn't do anything about. First was 9lb 8oz and the second was 10lb 6oz. I'll be back again, I love this venue especially in the evening. Fantastic weather and my first time @ Tunnel Barn, not my favorite sort of venue but every six weeks or so we have a competition between contractors in various Automotive OEM's. 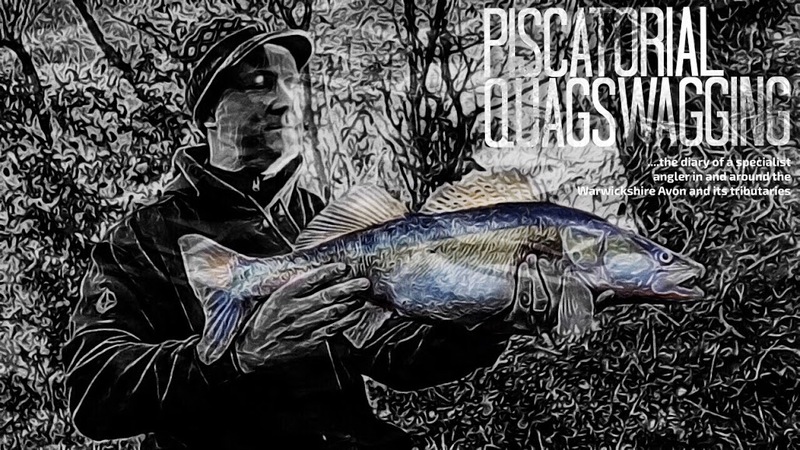 Only 11 of us today and we we fishing House Pool, I got peg 18 and was fishing 6" deep right in the margin on waggler / maggot with a float rod. You can see a couple of F1's in this picture. 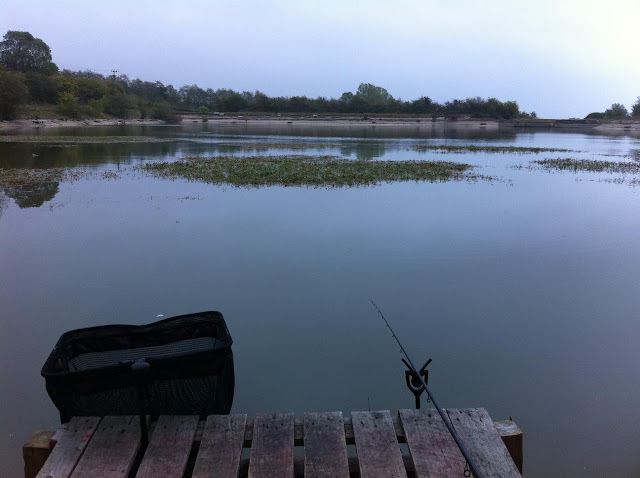 Was planning to fish Snitterfield Reservoir today, but last min change and I glad I did. 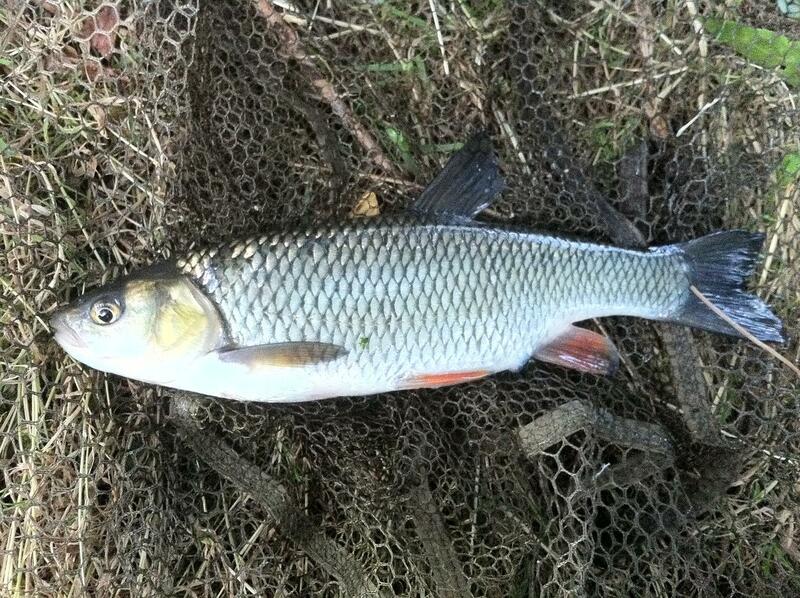 Bagged my first College Pool Barbel :) Only about 5lb ish but in mint condition, really did fight well too. Plastic corn topped halibut pellet. 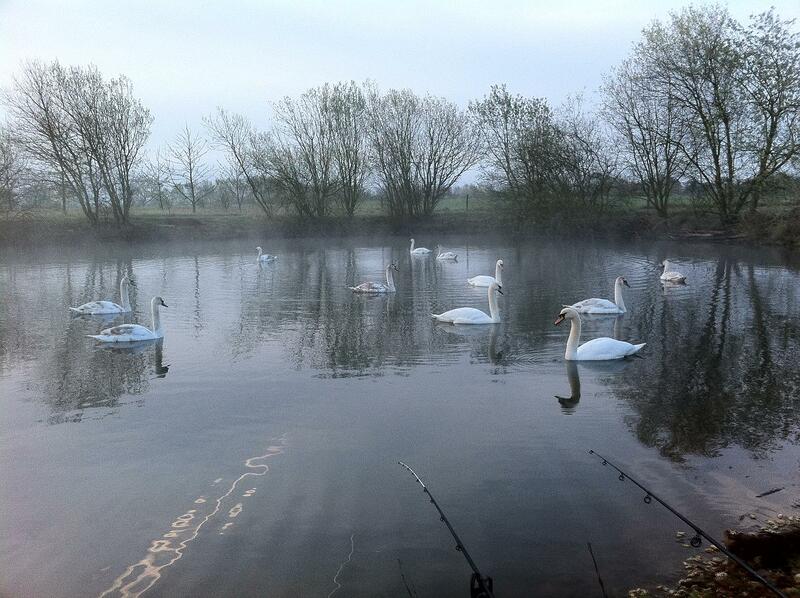 Got there early this morning and counted 20 Swans, for the first 2 hours I felt like packing up and going home, they wanted bait more than the fish :) . 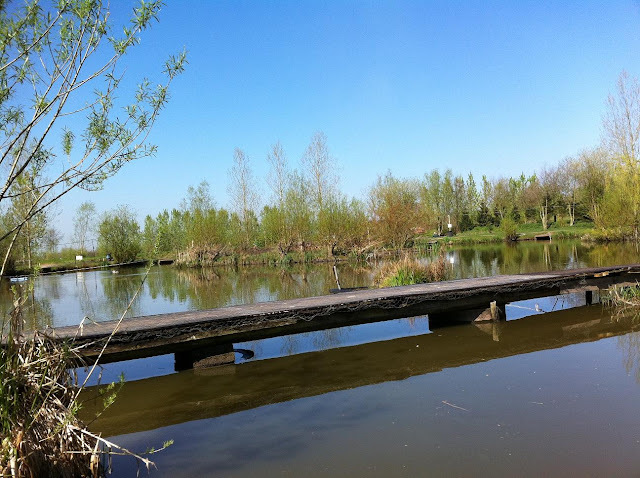 2 more Anglers there today, the chap that turned up just as I caught the Barbel had a couple of Carp when I let at midday and the chap next to me who was fishing maggot didn't even have a bite. I had a couple of more runs on the pellet but didn't connect and some knocks on the worm / maggot, a slow day but one that ended well. 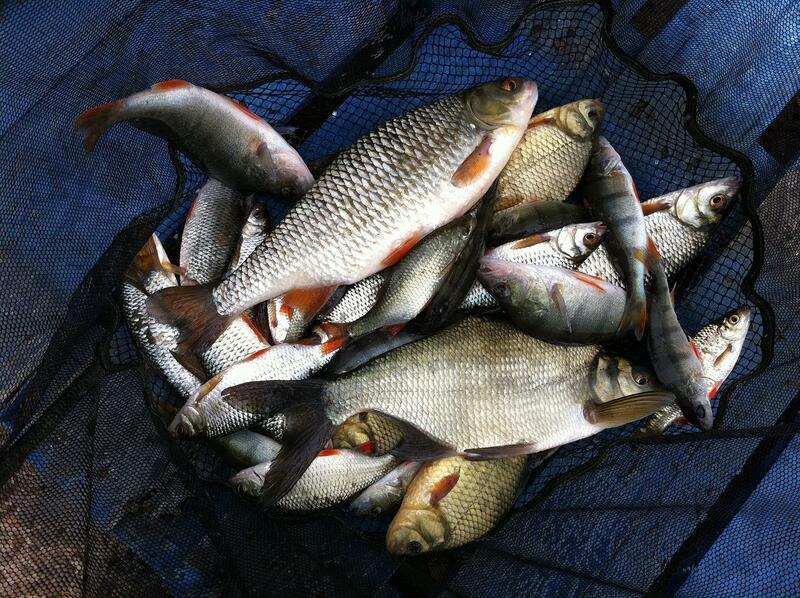 Anyone know if they are stocked Barbel or did they get in College Pool when the Warwickshire Avon flooded ? Took Ben for a stroll at the canal down the road, gave the Wife some relaxing time as the next one is due in 6 weeks, was looking at potential places to fish, compared to yesterday what a fantastic day. Quite a few fish topping and spotted a small dead Zander on the bank, even managed to get a few carp to surface feed on chum mixer. 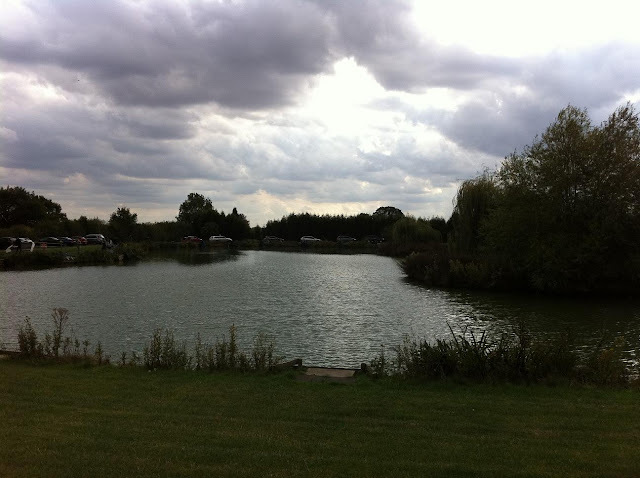 Defintely going to give this area a go for Pike, Perch and the Zander in the future. Never caught a Zander it's one to cross off the list. A Stag Do last weekend so nice to get out on the bank again, the weather report was wrong, not a very nice day at all. 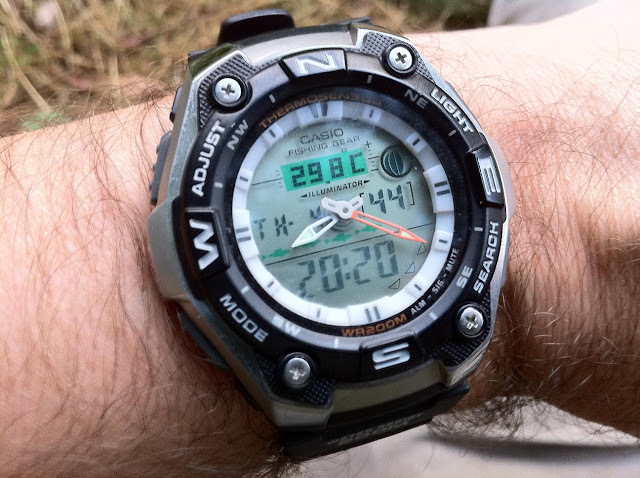 It was windy and not even that warm. 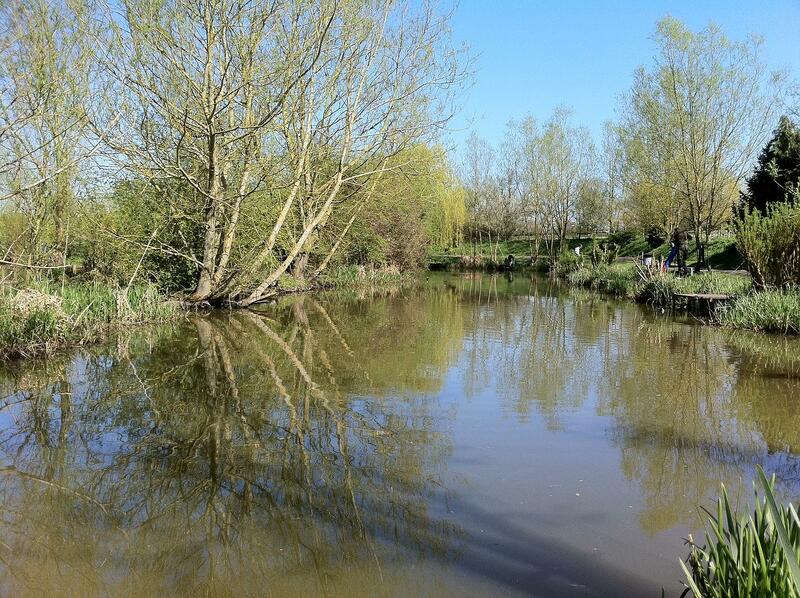 I got to College Pool for 3.30pm, 3 anglers were present, a lost carp, a small Barbel and a Bream between them. I fished at the far side of the pool, the deep end. 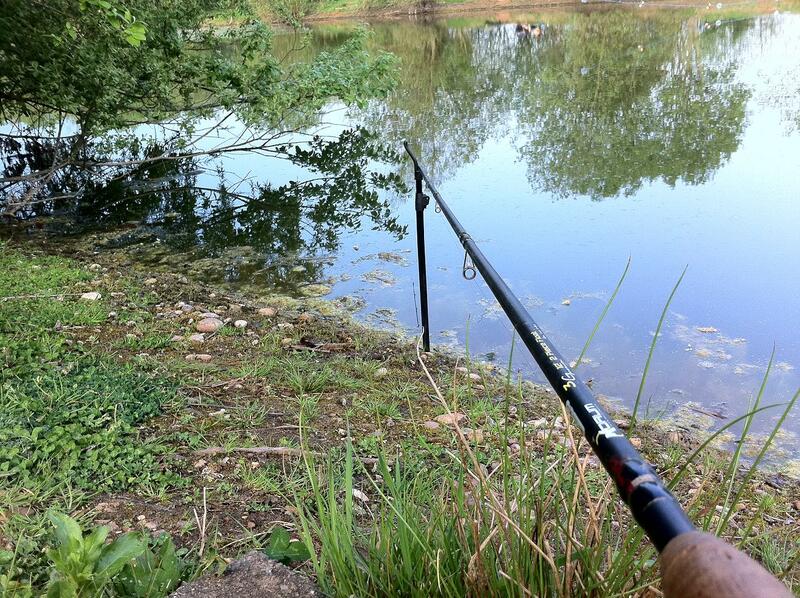 Had a sleeper rod out with a plastic corn tipped pellet and fished close in with maggots and lobs on a waggler. 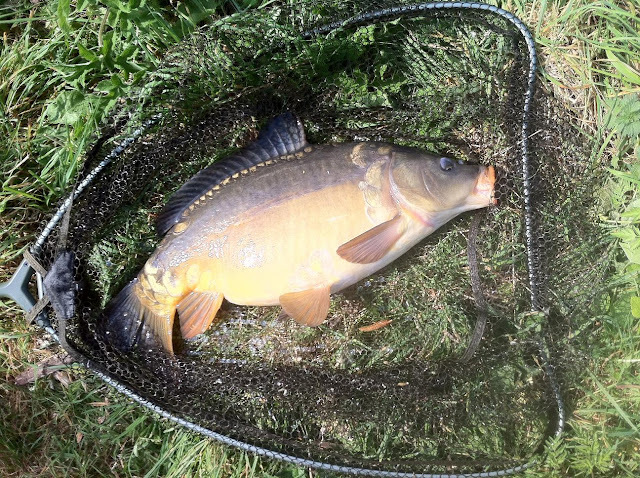 Bites didn't really start coming till 6.00pm, lost a decent carp on the sleeper rod, these college pool carp really do fight well, no sign of the big Perch sadly but managed to bag myself a nice carp about 6 / 7 lb on the waggler and worm, on light float tackle a cracking fight too. 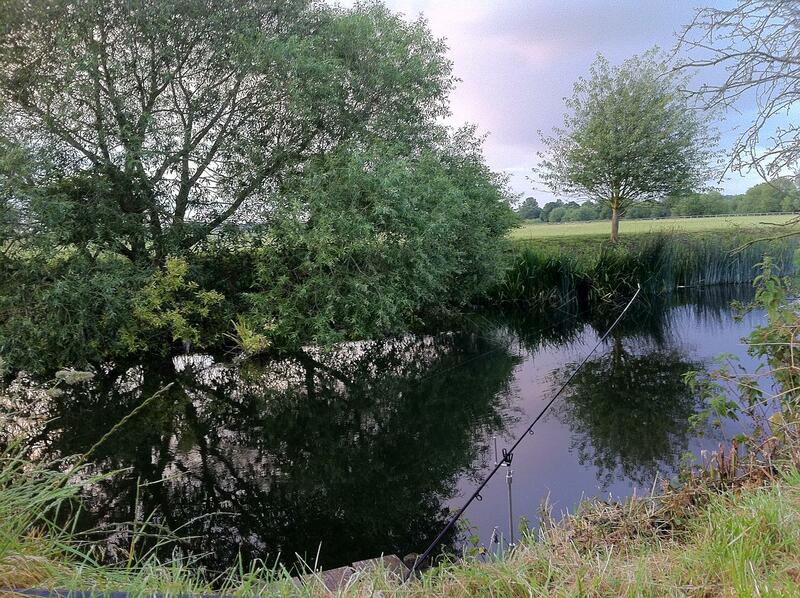 I left at 8.00pm but by 7.00pm the pool came alive, fishing topping everywhere and some big'uns too. as the nights are getting lighter I might give the evenings more of a go. Not a great afternoon at College Pool but when the water is warmer it makes a huge difference.